On December 17th, Kevin Gillespie, a chef-testant on the sixth season of the BravoTV series “Top Chef” was interviewed by CatholicTV Director Fr. Robert Reed. During his interview on the CatholicTV show called “This is the Day”, Kevin mentioned among many subjects, the challenges of abstaining and fasting during the Lenten season while also succeeding as a chef. Kevin also discussed the upcoming “culinary olympics” called the Bocuse d’Or in Lyon, France. Kevin was selected as one of semi-finalists who will compete to be the one chef to represent the U.S. in the 2011 Bocuse d’Or. The Bocuse d'Or semi-finalist chefs were chosen by the U.S. foundation's board of directors: Daniel Boulud, Thomas Keller, and Jerome Bocuse. The U.S. semifinals are set for Feb. 6, 2010, at the Culinary Institute of America in Hyde Park, N.Y. 24 teams (each consisting of a chef and his assistant) from around the world will meet at the Bocuse d'Or International Culinary Competition that takes place in Lyon, France, on Jan. 25 and 26, 2011. This episode of “This is the Day” will stream live at www.CatholicTV.com and on CatholicTV where available on December 18th at 10:30AM ET. The show will be rebroadcast at 8PM the same day and will also be added to the website archives the same day. Gillespie, an Atlanta native, began his culinary education at the Art Institute of Atlanta. 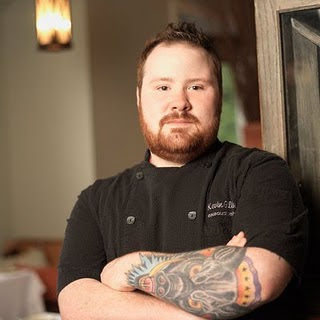 Gillespie went on to hold different positions at several well-known Atlanta restaurants including chef de partie at Atlanta Grill at The Ritz-Carlton, sous chef at TWO Urban Licks and chef de cuisine at Woodfire Grill. In early 2009, Gillespie joined Nicolas Quiñones and Bernard Moussa as a partner of Woodfire Grill. In addition to achieving this partnership at the restaurant, Gillespie also earned a spot on Bravo’s Emmy and James Beard Award-winning series Top Chef for the show’s sixth season in Las Vegas in 2009. Proving to be a top contender by winning several “Quickfire Challenges” and “Elimination Challenges,” he stands out as one of this season’s final four chef-testants.